Voltage drop is a term that refers to the reduction of supplied energy through a cable, in this case of a Solar Bore Pump installation. Voltage drop is influenced by the size (cross sectional area) and length of the cable and the voltage supplied. Voltage is a bit like water pressure and Amps is a measure of flow. A long, small diameter hose will restrict the flow to a point where hardly any water will pass through the hose. An increase of pressure will increase the flow through the hose like an increase of supplied volts to a cable. A low voltage solar pump system will require a large cross sectional pump cable to deliver power to the drive motor of the pump. ​The calculation of the cable size is part of the pump and solar panel sizing calculation, taken care of by the Lorentz Compass Solar Pump System Planner. 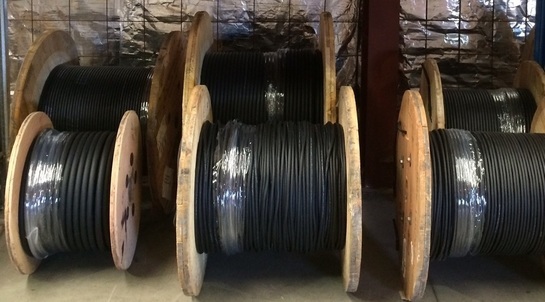 Submersible pump cable in-stock ready to cut to length. Submersible pump cable is designed for immersion in water and is suitable for use with submersible pump installations. Our cable is sources locally from an Australian supplier ensuring it meets the relevant Australian Standards and manufactures requirements. Use of the wrong cable may damage your pump and control system and will void the warranty. For a written quote and further details.